This week at CASE-ing The Catty we are bringing you a little sneak peak at some new products from the new Stampin' Up! Annual Catalogue 2015-2016 that is going live in just 4 days. Yay, I can't wait! You may have just come from Helen's blog where she showed us her little sneak peek, now it is time to see mine. I managed to get myself a few of the new products in the preorder us demonstrators are so privileged to do a whole month before the catalogue goes live for customers. I have decided to share with you a little sneak peek of a cute birthday stamp hitting our annual catalogue this year. I believe it has been current in the USA for quite a while but it is new to us here in Australia so I have chosen to use that for my sneak peek card. I found a great card on page 7 of the new annual catalogue using Endless Birthday Wishes stamp set which I just so happen to have here. I have cased this card using some of the sneak peek products from preorder as well. Can you pick what is new? The DSP I used is a great 6 x 6 paper stack called Cherry On Top. Most of these papers are pretty bright, but I found a few with some subtle colours & patterns on the back. The card stock is the new In Colour called Watermelon Wonder & the lace is a strip of trimmed down 1" In Colour Dotted Lace Trim. I used a blender pen to colour on the shimmery white card stock with some ink picked up from the lid of the ink pad. This was a quick and easy card using 3 new products you will be seeing shortly in our NEW annual catalogue. 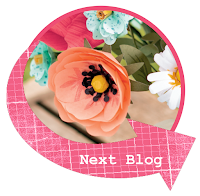 Next on our blog hop is Jackie. I'm sure she has something awesome to show you! Labels: 2015 - 2016 Sneak Peek, CTC 33, CTC Blog Hop, Endless Birthday Wishes, In Colour 2015-2016. I am loving the colours that you have used on this card Tricia. The lace is a perfect accent! 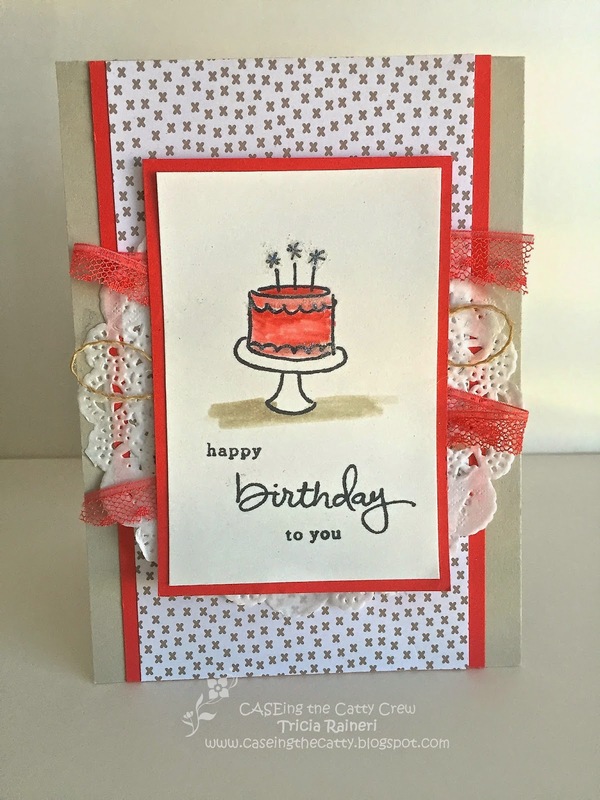 The lace just goes with all cards, I am really loving it and you have used it to perfection with this stamp set. Your card is so pretty Tricia! I love that you used the 'quieter' DSP from that stack...I will have to go searching for it now as all I could see were brights. :) Beautiful stamping too. What a cute card, Tricia. This set is on my wish list! Lucky you to have the Endless Birthday set already! I love how you've teamed it with the DSP and lace! This stamp set is right up there on my wish list, I think it will be really fun to use, I love your take on the sketch.